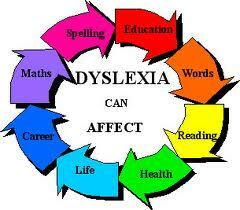 Dyslexia is a type of disability usually manifested a difficulty in reading and spelling with written language. Reading disability is usually diagnosed by an educational psychologist or a pediatric neurologist. Parents can help improved the reading skills of their children diagnosed with dyslexia. You can help your child if you observed him with these symptoms. Enumerated herewith, are the symptoms when a child has dyslexia. *** A child that has no sense of direction, he is confused which way is left or right and north or south. It is for this reason that sometimes a child with dyslexia tend to reverse the letter or words in writing or in reading. i.e. say for letters p for q, b for d and inverting words like rat for tar, won for now, saw for was and numbers like 15 for 51. He may mirrored write or read letters, numbers and words. *** The child has sequencing difficulties, that when reading and writing he may put letters in the wrong order. i.e. the written left the child may read it as felt, act as cat, reserve as reverse, except as expect and so forth. He may put the syllables in the wrong order like animal as ‘aminal’, hospital as ‘hopsital’. He may omit or add letters like cat for cart, sing for string. *** He or she has difficulties with little words like a for and, then for there, were for with. Add letters which do not appear on the texts. *** Strange approach in reading and writing spelling, is the severe forms of dyslexia and characterized by the following symptoms: The child guesses wildly at words regardless if they make sense or not. Also, the child spells bizarrely,the out of this world words. *** Dyslexia children have difficulties with handwriting, symptoms like illegible writing, letter inconsistencies, a mixture of upper and lower case letters, irregular letter sizes and shapes, unfinished sentences, etc. Children with dyslexia can learn to read and write with the right approach for teaching. Herewith, are strategies to cope up dyslexia. *** By way of echo reading, this strategy helps struggling readers with fluency, reading orally, new vocabulary and comprehension. It is a simple reading strategy to help your children gain skills. Get a book, for you and your child to do echo reading. As you read, the child sees the words in the book and follows reading along in a text. *** The multi-sensory reading approach, children with dyslexia can learn best in this strategy because it incorporates visual, auditory, kinesthetic and tactile learning. The three modalities have been summarize as Visual, Auditory and Kinesthetic (VAK). Children with dyslexia may need emotional support for the many challenges they face. Offer encouragement being the advocate of your child. Focus on your child’s strengths and immediate weaknesses. Foremost, create a healthy relationship with your child.